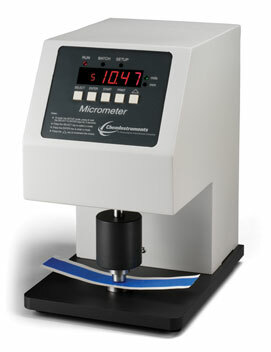 Ideal for any number of industries, the ChemInstruments Micrometer accurately measures the thickness of a variety of substrates. The standard unit meets or exceeds numerous test methods, including ASTM D645, D374, D3652, PSTC 133 and TLMI T-411. It can measure paper, tissue, corrugated paperboard, carton board, fiberboard, felt, film, foil, plastic and rubber. This versatile Micrometer unit features three modes of operation: single, continuous and batch. In the single test mode, the presser foot cycles with each press of the start button. In the continuous mode, the presser foot cycles continuously. In the batch mode, the micrometer can be set to run a series of measurements. The number of cycles can be set from one to 50 with a pause between each measurement. In all modes, the presser foot travels and pauses per ASTM D645 method. 美国ChemInstruments 公司研制的MI-1000测微计适用于各种工业用压敏胶衬底的厚度测量. 符合欧美及其它国际的测试标准, 例如ASTM D645, D374, D3652, PSTC 133 及 TLMI T-411等测试标准. 可用于测量普通纸张, 棉纸, 波纹纸板, 硬纸板, 纤维板, 毡毛制品, 薄膜, 铝薄, 塑料薄膜及橡胶等材料的厚度. 此测量计可用于单一, 连续及批量等测量. 在单一测试时, 测量压头按照起动按钮的指令做单次运动. 在连续测试时, 测量压头按照所编制的程度做连续性的运动. 在批量测试时, 测量压头按照所编制的程度做序列性的运动, 循环动作可设定为一到五十次并可做间歇停留. 测量压头之行程及停留的设计符合测试标准ASTM D645.